Expedition Station in Keystone Real Estate is one of several River Run condo complexes. Located just beyond the Dercum Square Ice Rink/Putt-Putt Golf Course, Expedition Station can be one of the quietest River Run condo complexes. Built in 1998 there are 92 units comprised of 6 – studios, 38 – one bedrooms, 44 – two bedrooms and 4 – three bedroom condos. Some of the one bedroom condos come with two bathrooms and a murphy bed to sleep additional people. There are only a few River Run condo complexes with pools and Expedition Station is one of them. Beyond the year round outdoor heated pool there is also outdoor hot tubs, steam room, fitness room, lobby with stone fireplace and a pool table, underground garage and ski lockers. Expedition Station is located only a few hundred yards from the Keystone Gondola and the shopping/dining in River Run. 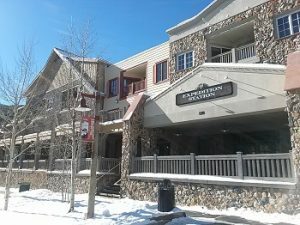 If you are looking for a condo for sale in Keystone CO with the potential to rent, River Run condos are some of the best. For additional information about Keystone CO Real Estate, River Run condos, previous sales data and more, contact us today.